When using a private TETRA system in a multi-customer or client environment, one disadvantage is that the switches do not support separate streams from these interfaces. They also do not shield information from being viewed or shared from one customer to another. Clients indiscriminately receive all information from the switch gateway, which is undesirable. Our KoliLink XML interface allows TETRA network owners to direct information streams from interfaces for each customer, and provides an XML stream to each customer so that they can run their own applications. The Admin client configures which radios each customer has access to, and which specific functionality is provided to each. 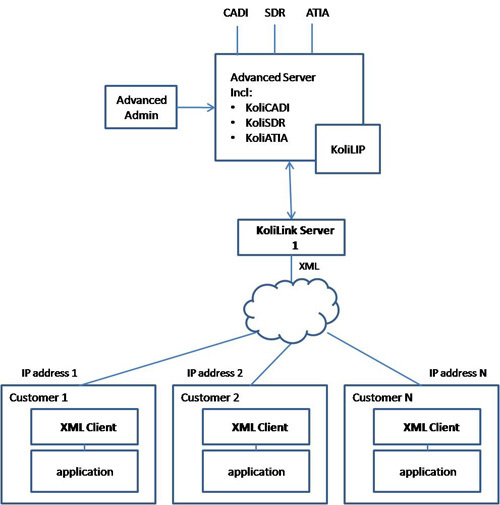 Kolibri Systems has its own XML client developed to match the KoliLink XML interface. However, KoliLink’s interface is open to any developer. Currently, KoliLink can be provided for Motorola Dimetra IP and Rohill TIG infrastructure.